3. Before fueling discharge any static electricity by touching a metal surface. Repeat before removing nozzle. 4. If a fire starts do not remove nozzle - Leave the area immediately. 5. 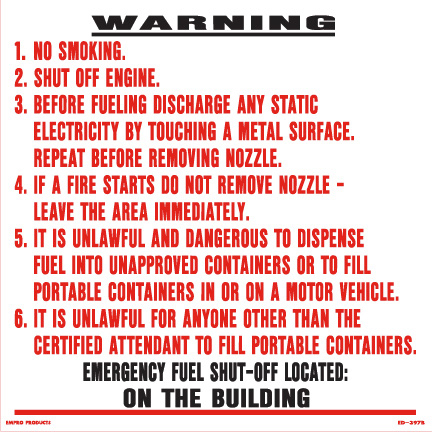 It is unlawful and dangerous to dispense fuel into unapproved containers in or on a motor vehicle. 6. It is unlawful for anyone other than the certified attendant to fill portable containers.